Get free updates on new episodes & offerings to help you stay present and on task. Thank you for joining us on a Path of Presence. We'll be in touch shortly. The operative word here is Integrated and balanced because as creative people who are never at a lack of ideas - we tend to give it our all and inevitably, burn out because of our unfiltered zeal. So how do we go about thriving, to surf the zeal that channels as us and to not simply be in the flow, but to become the flow? Well, that’s the conversation, the deeper work of becoming present to the process, isn’t it? As entrepreneurs, we plug away in our home offices, many times, alone. and sometimes, we don’t get the acknowledgment of the IMMENSE TASK that is before us. Some of us are just beginning to decipher what want to build - as an online business - whichever you are, I want to know that you have a place here at Path of Presence. Many go about building our business as though it is war - suiting up, calling on all our resources because we know we’ll need them, and marching them onto the battlefield as though we are fighting for our lives. But, does it need to be that way? Some of us are so scattered and unfocused that we find ourselves running around in circles - feeling incompetent and incapable. We just want to cry - from frustration, feeling as though we are sitting in the car, in the quicksand, and it’s not turning on and we are getting nowhere quick. Maybe you are running a flourishing business OFFLINE and seeing clients, but you want a better way to do things, a more efficient way - so that you are no longer trading dollars for hours - but the transition — seems to be quite monumental. Even finding an extra hour in the day might feel impossible with your level of busy. Well, I honor your journey, and I can relate … Since I got out of corporate America some 2 decades ago, I never looked back. Being an entrepreneur is awesome, and comes with it, freedom, creativity, and space to do whatever you want - a unique set of experiences that others do not get to undergo. A true heart of an entrepreneur is that you never run out of ideas - creativity brims from the inside out - and our task really is to find a system and a method that tempers the creativity so that it has a way to go from idea to product; from concept to manifested product, service or program. 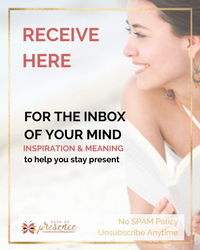 To get from the brilliance of what is wanting to express, through you, to a tangible product that is self-sustaining, generates income and thus a livelihood for you. At some point, to be a sustainable business, we must also balance our altruistic endeavors - our selfless acts of service with the bottom line. This is not selfishness or being money hungry - this is reality and the truth of sacred economy - of exchange, monetarily or otherwise. So in our journey of this podcast, I decided to break it into 4 quarters a year, 12 episodes per quarter, which works out well with a week of break in between to recalibrate between seasons. Along with the journey on our path of presence, it isn’t that getting to the finish isn’t important - it IS … completion is awesome and there is nothing like it. But, going through the process of being pregnant with an idea — for a program - a book - a course - a service of some sort - getting our ducks in a row - learning how to use systems - creating a process — all that is the journey of being pregnant. As we go through it, the 1st time, especially, everything is new - the content, the relationships, the process, the entire experience! And then, as we continue to undergo some more, we become familiar with the landscape and we become more integrated into our own skin. So in this season of “The Journey,” I’ll pick topics each week to address a piece of our journey - of birthing not simply our program, but ourselves in the process. Let this podcast accompany you as you go through his journey of entrepreneurship - in whichever trimester you may be. I promised to give you a preview of the upcoming episodes in this series and here they are so you can tune in with us. Season 2 will take us from here all the way to the end of this year, through the hustle and bustle of the holidays, and I’m praying that this podcast can be a gift, a nugget of roundedness as you undergo this miracle of this season - family, work, business, sanity, friends, family and your ever expansive, transformational soul. 10/05: You’re listening to episode 1 - which is a preview of this season. EveryThursday, a new episode will be released. 10/19: Episode 3 - the topic is all about focus. If you feel you need some, listen in! 10/26: On episode 4, which will be airing October 26th, our topic will be about getting ourselves organized. 11/02, 11/09, 11/16: On episodes 5, 6 & 7, respectively, we'll be specifically addressing what Vision-Guided, Spirit-Led, and Heart Centered means in business building. 11/23: This episode is right before Thanksgiving, and it will be about how to give it away, and get more in return than you can ever expect. 11/30: We'll then talk about being of service at the end of the month on the 30th. 12/07, 12/12 & 12/21: As we dive fully into the holiday season, our shows will help you keep your focus. For the rest of December, we'll talk about your "why" (December 7th), your gifts (December 12th) and be listening for guidance (December 21st) on how to best channel your gifts to serve others. I am really excited about this lineup! We will talk about the nuances of the rhythm and energy that most, if not all entrepreneurs face, no matter where you are on your unfolding path. Just to be sure, please join our Path of Presence newsletter to get updates on new episodes that are available. AND If you would like to be in community with other conscious heart-centered, spirit-led entrepreneurs, please hop over to our Facebook group and join us! www.facebook.com/groups/pathofpresence. If you're not already a member, submit a request and we'll see you on the other side. Please submit questions to: Light @ PathofPresence.com.